Are you aware of what your products contain? Calendula infused Extra Virgin Olive Oil, Macadamia Nut Oil, Vit E oil; pure essential oils of tea tree, lavender and rose geranium; natural beeswax. Thursday Plantation Tea Tree Ointment contains (quoted from their website): Melaleuca oil 5% w/w/ Tocopheryl Acetate 1% w/w Other Ingredients: Tea tree (melaleuca alternifolia) oil 50mg (per gram). Paraffin, cetearyl alcohol, sodium lauryl sulfate, tocopheryl acetate (vitamin E). Tea tree oil active contains minimum 36% terpinen-4-ol. The organic herbal ointments/salves/balms are handmade by infusing need-specific organic herbs in fractionated coconut oil and extra virgin olive oil for 3 weeks, then gently blending the resulting herbal oil with natural beeswax and natural Vitamin E to obtain the creamy consistency. Healing butters and pure essential oils are then added. The result is an amazing product that is concentrated for intense healing properties that may be used several times daily, as desired. Actions: healing, soothing, pain relieving, antiseptic, anti-fungal, astringent. An excellent salve for the First Aid Kit. I make this very special ointment by infusing powerful organic herbs that are well known for treating open wounds, sores and other skin maladies. The herbs are slow infused in a blend of olive and rice bran oil. This is a pure, natural and powerful salve to use for any skin condition. Results are often seen overnight. Keep it in your cabinet or First Aid Kit and it will last for years. Warning: This is my best selling ointment and it does take me a while to replenish it when it runs out of stock. If you need it and it's listed as out of stock, please email me for expected restocking date. Actions: Anti-bacterial, anti-fungal, antiseptic. Chapped, cracked skin, scratches, bites, sores, wounds, all skin disorders that require healing attention. Ingredients: Goldenseal root, myrrh, St. John's Wort, calendula, echinacea root and leaf, natural beeswax, essential oils of lavendin, white camphor, Siberian fir, niaouli, litsea cubeba, lemon eucalyptus. Actions: A soothing antii-fungal salve for persistent skin rashes. A natural alternative to strong steroid creams. Use liberally on a daily basis for athlete's foot, fungal infections, eczema, psoriasis, herpes, boils, ringworm and other difficult skin conditions. Ingredients: Extra virgin olive oil infused herbs of black walnut, chaparral, myrhh, burdock, echinacea, slippery elm, calendula, nettle, st. john's wort. Vit E, beeswax, and essential oils of peppermint and tea tree. Calendula Ointment contains Marigold (Calendula officinalis) which has antibiotic, anti-fungus and anti-inflammatory properties and promotes healing of minor cuts, scrapes, burns, bruises, chicken pox rash, diaper rash, eczema, insect bites, fungus, and varicose veins. I added natural cocoa butter for a really nice, creamy texture which is easily absorbed. My velvety Calendula Cream is one of the most requested products I make. Customers say they use it for many things: dry skin, hard to heal sores, various skin problems, and recently I've had requests to make it into a lip balm since some are using this jar of cream for their chapped lips!! I have recently updated the formula to include a bit of lavender and frankincense for additional skin healing properties, but it is not heavily scented. It's really divine!! Contains: Calendula herbal oil, Aloe Vera, natural cocoa butter, Vitamin E Oil, lavender, frankincense, natural beeswax. Created using triple infused comfrey and arnica (for pain), lavender and tea tree essential oils. Comfrey ointment is known to assist the healing of bruises, sprains, back pain and aches and pains associated with arthritis. For TENNIS ELBOW, twisted ankle, shoulder, wrist, or similar type pains, rub into the painful area three times a day, for five minutes each time. Reportedly, the problem should be relieved within three days. Not to be used on broken skin. Provides healing and soothing relief from itching, redness and inflammation due to Eczema, Psoriasis, Dermatitis, dry and other skin conditions. Use twice a day for quick results. Includes organic unrefined shea butter, natural Vitamin E oil, organic avocado oil, chamomile, helichrysum, rose geranium. Actions: Relieves respiratory congestion due to colds, allergies or sinus problems. Safe for all ages, rub on chest & under nose. Ingredients: Olive oil, beeswax, essential oils of eucalyptus, wintergreen, sage, rosemary, white camphor, pine. 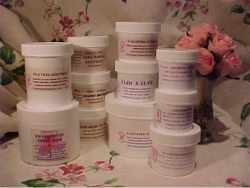 Actions: Calms & heals skin irritations, rash, psoriasis, eczema, dry skin, dermatitis. Ingredients: Lavender flowers, goldenseal root, chamomile flowers, calendula flowers; olive oil; olive oil, sweet almond oil; beeswax; essential oils of lavender, chamomile. Protection for minor cuts and abrasions, skin rash, antiseptic treatment, accelerates healing of chapped and irritated skin, lips too. Particularly helpful for diabetics who tend to get hard to heal sores on feet, legs and arms. All natural for everyday use; apply 2-3 times daily. The natural base of oils and beeswax repels water to protect the area. Contains: Calendula infused Extra Virgin Olive Oil, Macadamia Nut Oil, Vit E oil; essential oils of tea tree, lavender and rose geranium; natural beeswax. Comes with an extensive list of tips and recipe for home treatment, as well as an explanation of the benefits of each ingredient. Ingredients: Witch hazel, St Johns Wort, avocado, comfrey, mullein, chamomile, calendula triple infused oils; aloe vera; cypress, geranium, juniper, myrrh, niaouli, palmarosa, patchouli, tea tree.